One day in the summer of 2011, Los Angeles law professor Yxta Maya Murray visited the Tate Britain and was shocked to see there Cathy Wilkes’ installation (We are) pro-choice, a phantasmagoria involving a “weeping” naked mannequin sitting on a toilet, as well as a ladder and some banged up kitchenware. Murray gleaned that something feminist was in the offing, but couldn’t tell quite what that might be. It seemed evident that Wilkes was making a case that women are miserable in today’s brutalist western-capitalist society. However (she wondered), were there any other, more hopeful, conclusions to draw from the work? Pro-choice sent her off on a six-months long adventure of trying to understand this amazing art – intellectual travels that drew her to the lands of French/Bulgarian feminist Julia Kristeva, U.S. legal theorist Drucilla Cornell, and to the strange ways of Irish Wilkes herself. In the resulting essay, Murray asks the following questions: What is this suffering that Wilkes’ describes in (We are) pro-choice? How does art help us understand subordination that might be reversed through legal reform? And what kinds of radical changes have to be made to museum law and policy that would allow art institutions to help us liberate the oppressed? image(c) 2008. 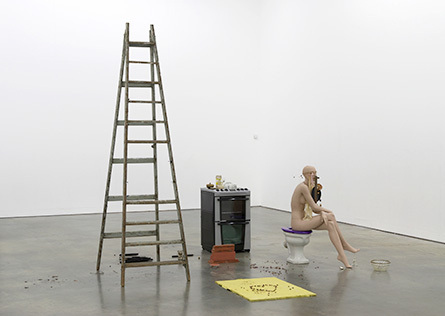 Cathy Wilkes, (We Are) Pro Choice.